So thanks to the automatic linear tensioners you can avoid vibrations and noise linked to functioning. 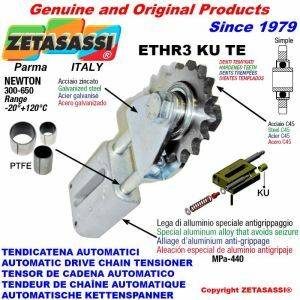 These automatic linear chain tensioners do not need the intervention of any workers so you can save time for the maintenance and for the control of the machineries on which they are set up. 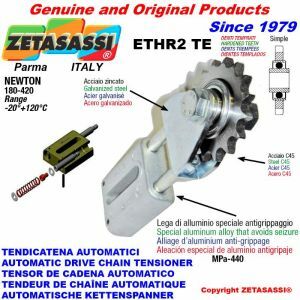 The tlinear chain tensioner ETHR has a light alloy body and a zinc-coated tensioning head. They include a sprocket. The body is made of a special anti-seize light alloy that is perfect for its use. The anti-seize material allows the steel studs to slide perfectly. They are inside and pushed by steel springs . On the studs we set up a galvanized steel head with U section where you can set up sprockets with double shielding bearings. They include sprockets with double shielding bearings. They are set up on the tensioning head and available for the most popular chain pitches. On demand we have sprockets not included in the catalogue. For all version is available a KU type with “ self-lubricating sliding bushes”.